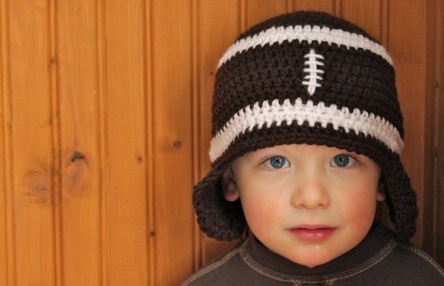 With only two weeks until Super Bowl 2012, I figured it would be a great time to use my free Versatile Earflap Hat Pattern to make a football hat. Please excuse the chin drool – someone is getting his 2-year molars. This may be why he wasn’t too cooperative of a model today LOL! You can download the free pattern here, then reference below for where to add your white stripes. Finish the hat by lining up the earflaps to find the center, stitch a long, white line down the center front (I stitched a second line over the first), and then stitch several short marks across the long line. 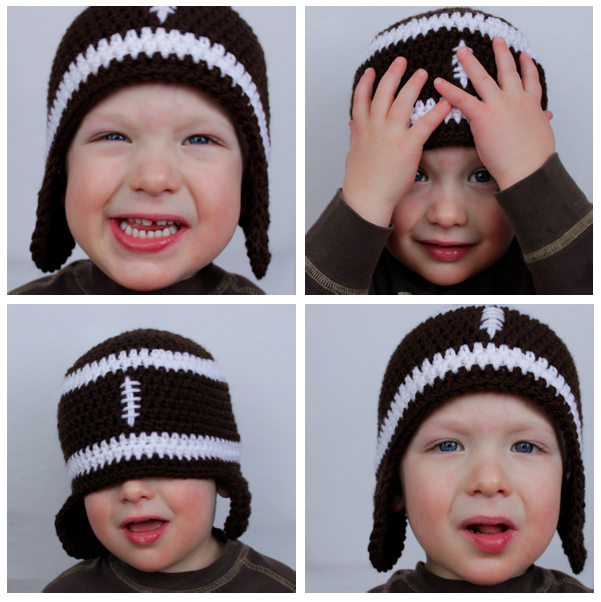 If you want a football hat with more team spirit, add braids, tassels or pom poms in your favorite team’s colors to the center of each earflap. Cute hat, sporty looking with the earflaps. Thank you. love love love this pattern! Made it as part of a sports hat ensemble (baseball and basketball hat included) for my friend’s little guy. She loved it! So excited to have pics made in it. Thanks for sharing the pattern! I noticed you slip stitched one ear flap but not the other. I’m new-ish to crochet so I need help to understand! Thanks! Hi Stacey. As the pattern is written, you do not finish off before starting the earflaps. The slip stitches to the first earflap will position it in the correct spot. Count to the left as the pattern states then continue with crocheting to the left as you normally would. Fasten off that 1st earflap. Then count to the right as the pattern states (passing the back seam). After attaching the yarn to the designated stitch, crochet back to the left (toward the back seam). If you don’t want to slip stitch to the 1st earflap, you could finish off after the last round then just count over and attach the yarn in the stitch you would have slip stitched to. Does this answer your question? Let me know if you have any others. What size did you create for your 2 year old shown in the photos? The child or toddler size? I’m guessing it’s the child size by the way you’ve listed things, but want to be sure because I’m having a friend create the pattern. Thanks! I made the child size, but that doesn’t mean all two year olds will need that size (I just knew he would grow out of the toddler size quickly). The toddler size should fit a head circumference up to 19 inches and the child size should fit a head circumference up to 20.5 inches. Thanks so much! She has a pretty small head, so I’ll probably go with the toddler size then! What size crochet hook are you using? Great pattern. Just what I was looking for.